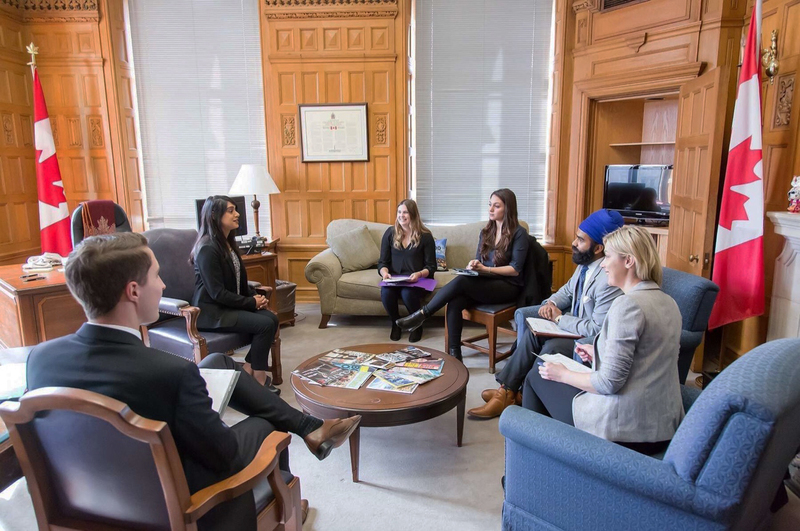 Earlier this month, representatives from Wilfrid Laurier University’s Students’ Union travelled to Ottawa to advocate on behalf of the interests of Wilfrid Laurier University students. The representatives included Kanwar Brar, Students’ Union president & CEO, Stephanie Bellotto, vice president: university affairs, Shannon Kelly, assistant vice president: university affairs Waterloo and Zana Talijan, vice president: university affairs Brantford. The representatives met with several members of parliament over the course of their advocacy trip, including Bardish Chagger, MP for Waterloo and the Minister of Small Business and Tourism, Richard Cannings, an MP from British Columbia, Marwan Tabbara, MP from Kitchener South-Hespeler and Kate Young, MP from London West. Brar noted that he and the other Students’ Union representatives had three main issues they spent the trip advocating for. “Our three priorities were post-secondary student support program[s] for indigenous students, student work integrated learning programs slash experiential learning and students with disabilities,” Brar said. “Since the federal government plays a role in all those three issues at some level, that’s how we prioritized and advocated accordingly for students,” Brar said. When asked about the outcomes he would like to see from their advocacy trip, Brar explained that a lot of the things they are advocating for depend on suitable financing, which in turn depends on the federal budget. “A lot of the stuff happens in regards to budget implementation, so our goal would be that we prepare briefs and submit a pre-budget submission report for next year’s federal budget, so those asks can be taken into consideration, because a lot of the asks are financial-based,” Brar said. “Our plan is, we’re going to be writing briefs on the issues and sending those to MPs, who will later ultimately forward that correspondence to the ministers, whether that’s the finance minister, or any other ministry that the issue is applicable to, because it helps for members of parliament to relay this on behalf of us,” Brar said. Brar also noted that, due to the timeline of federal budget submissions, their planned follow ups with the MPs would happen toward the end his term as president and CEO of the Students’ Union. “That would happen after our term is done of course, because budget submission wouldn’t happen until the summer of next year,” Brar said. Brar also said that advocacy trips like this past one are important to promote student interests partly because of which government bodies have jurisdiction over post-secondary education. “Advocacy trips are important because … these student concerns are always rising, there are new priorities, there are new challenges, which are within the post-secondary realm,” Brar said. “Our approach has always been that we’d rather have a seat at the table than picket at the door. And the reason we go with that is that we find it’s really progressive for us to relay our priorities, relay our concerns, our thoughts, to elected representatives so they can listen to us and we can find a way to move forward together,” Brar said.